Wandering around Augsburg, you have no idea that there is a village that has hardly changed since 1520 within the city. 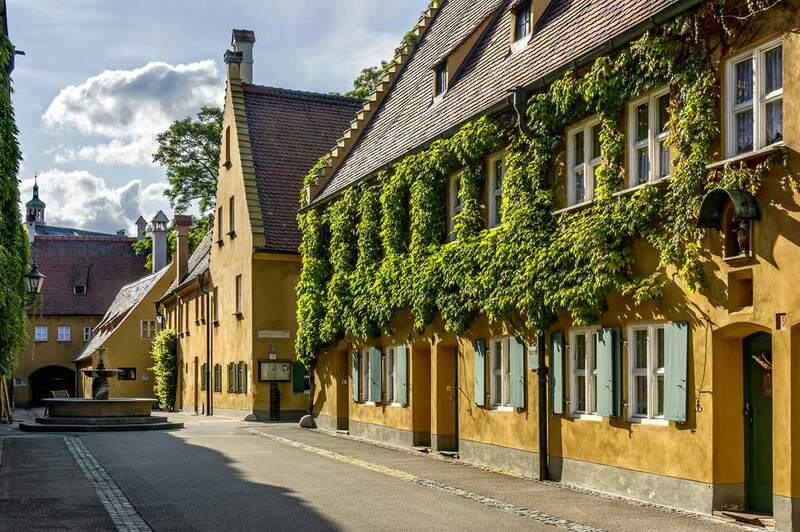 The Fuggerei is one of Bavaria's most fascinating secret attractions. Discover the history and visitor info for the world's oldest social housing complex still in use. This historic walled enclave was created by Jakob Fugger, known as "The Rich". And he was really, really wealthy. Jakob minted coins for the Vatican and personally bankrolled the Holy Roman Empire and Habsburg family. He was one of the wealthiest and most powerful financiers in history, leaving more than seven tons of gold to his successors. Not content with material goods, Jakob was also committed to doing good deeds. Along with the help of his brother, Jakob financed the building of the Fuggerei with an initial deposit of 10,000 guilders between 1514 and 1523. It was a refuge for poor and provided a tight-knit religious community. The residents were primarily families that offered their skills as craftsmen and day laborers. People traded services for goods and operated small businesses from their homes. A school on the site, established in the mid-17th century, provided Catholic-based education. Its most illustrious resident was Mozart's great-grandfather, a mason who lived in the Fuggerei from 1681 to 1694. Look for the stone plaque commemorating his patronage. The original structures were designed by architect Thomas Krebs with St. Mark's Church added by Hans Holl in 1582. More housing, a fountain and facilities were added up until 1938, but - like much of Germany - the Fuggerei was damaged during WWII. A bunker was built during the war to protect the residents and today serves as a museum. After the war, two widow's buildings were built to support the woman and families that were left behind. Luckily, the buildings that were destroyed were rebuilt in their original style. To accommodate the growing throngs of tourists, a gift shop, manicured gardens and beer garden were added. There are currently 67 houses and 147 wohnungen (apartments), most still occupied. And it is still supported by Jakob's charitable trust established in 1520. What makes the Fuggerei Special? Not only does the Fuggerei have a distinctive past, it has a unique present. Residents here only pay an annual rent of 1 Rhein guilder, the same as in 1520. What is that in today's currency? A whopping .88 euro cents, or just under $1 US. Understandably, this makes residence in the Fuggerei still highly desirable. There is a four year waiting list to move into the Fuggerei and resident Frau Mayer called her acceptance "winning the lottery". Residents are also asked to contribute to the community by acting as night watchman, sexton or gardener. The community is historically protected and there have been few changes to the living quarters - but there have been changes. Vital updates include electricity and running water. Housing units are self-contained 45 to 65 square meter (500–700 square feet) apartments with a kitchen, parlor, bedroom and tiny spare room. Each has its own street entrance with charming doorbells like cloverleaf and a pine cone. Their shapes helped residents find the right home by feel before the installation of streetlights. Ground-floor apartments offer a small garden and shed and upper-floors provide an attic. To see what the units are like, there is a ground-floor apartment open to the public as a museum. In addition to the tough criteria for entry, there are restrictive living conditions like a curfew. The gates are locked every day at 22:00 and after-hours entry is only available by the night watchman and a payment of50 cents (or one euro after midnight) is required. Each year an estimated 200,000 visitors go to the Fuggerei. Visitors can enjoy the unique community and explore the museum which displays a perfectly preserved apartment and information about the Fugger family history. You can also check out the WWII bomb shelter and one of today's modern apartments. While the people who live here are not part of the exhibit, many of the elderly residents are happy to tell you more about living there. Greet people with the friendly Bavarian greeting of Grüß Gott and be respectful of the community and area. Tours are available for groups and school classes and take 45 minutes with a guide in original dress. Groups tours are for up to 35 people and cost €90 in languages other than German (the German tour is €70), plus €3 entrance fee. Transport: There are directs regional trains from Munich to Augsburg which take about 40 minutes. Transport Tip: The Bayern-Ticket only costs 23 euro and includes local and regional trains in Bavaria from 9:00 to 3:00 the next morning. Each additional passenger costs 5 euro (maximum of 4).